Of course Plan A is to get planning permission. Of course Plan A is to live in a proper, legitimate house, pay council tax and have my rubbish collected in bins. But that may not happen. It, actually, may not happen for three reasons. Firstly, and very probably, planning permission may simply be refused. That is actually pretty likely - I probably have less than 50% chance of getting planning permission anyway. Secondly, planning permission may be granted but it may be granted too late. I must have something considerably more comfortable and weatherproof than the Summer Palace before winter; neither my mental nor my physical health would stand up to a winter spent literally out of doors. So if I haven't got planning permission by mid-July I have to go to plan B anyway. Thirdly, planning permission may be granted but I may not be able to afford to build to the quality required. This is complicated. In theory one third of what I invested in the farm is loan, to be repaid. It was never likely that it would all be repaid, but I was hoping that half of it would be. This now looks unlikely. If I had got half back, I would have £16,000 to pay for materials for my house, which may sound ludicrously little but actually as self-builders of houses with planning permission can reclaim VAT it's effectively £20,000 and it is - just, barely - enough. But unless I get some of the loan back I have £6,000, and that just isn't. Of course I could get a mortgage - I do own the croft - but I'd have to get a steady job to repay it, and I really don't want to do that. So there has to be a plan B, and plan B is about counting assets. I have several hundred harvestable sitka trees. I have a growing barley crop, and shall have straw by autumn. There is also wool, but asking around I find that unless you treat wool with some fairly nasty insecticide it doesn't make good household insulation. 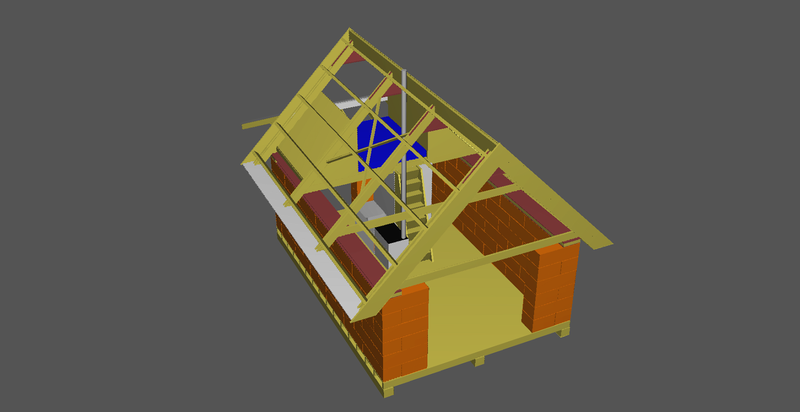 However, a log cabin is possible using materials I don't have to pay for. If I build a roundwood pole structure with straw bale walls, I need to pay for the render on the walls... at least, in theory I could make it from raw materials, but that's too complex and I don't have time. But the render is affordable. Unless I thatch the roof - which takes skill I don't have, and longer, better quality straw than I'm likely to get - roof insulation also needs to be paid for. In any case, windows, hardware, electrical installation and drainage need to be paid for. It may be, for the first winter, I have to do without electricity all together. It may be, for the first winter, that I have to do without glass. But a habitable house for £6,000? Yes, I think it can be done.